Modern / Contemporary / Transitional kitchen including Carrara Marble Countertops, white beveled subway tile and lucite counter stools. Contemporary / eclectic lighting. 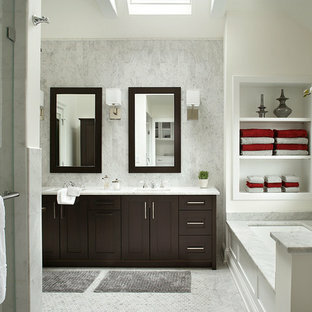 Design by Holly Bender of Holly Bender Interiors. Photography by Scott Hargis Photography. White Carrara marble tile with brushed nickel fixtures, frameless glass door and our hidden curbless drain system at the back of the shower (trench drain style). 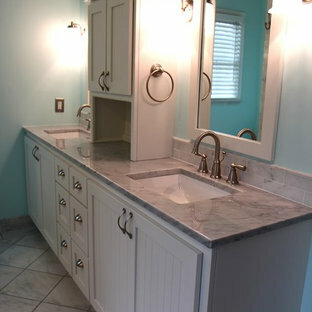 Custom white maple vanity with beaded shaker doors, tower, white Carrara marble countertop, rectangle under mount sinks, brushed nickel faucets, custom vanity mirrors and white Carrara marble tile floor. 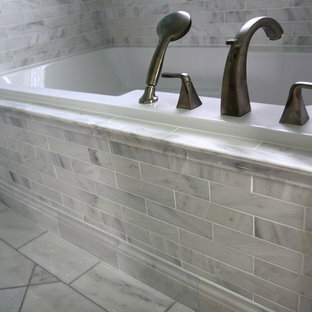 White Carrara marble tile on tub splash with brushed nickel fixtures. 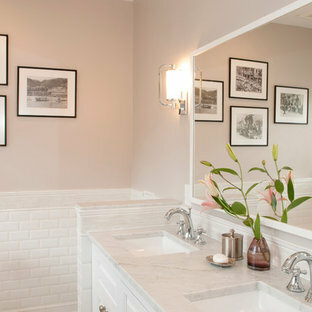 Ulrich Designer: Tom Santarsiero Photography by Peter Rymwid This is a master bath with subtle sophistication and understated elegance. The cabinets were custom designed by Tom, with straight, simple lines, and custom built by Draper DBS of walnut, with a deep, rich brown finish. The richness of the dark cabinetry juxtaposed with the elegance of the white carrara marble on the countertop, wall and floors contributes to the room's sophistication. Ample storage is found in the large vanity and an armoire style cabinet, designed to mimic a free-standing furniture piece, that is positioned behind the door. Architectural beams placed across the vaulted ceiling bring a sense of scale to the room and invite natural light in through the skylight. 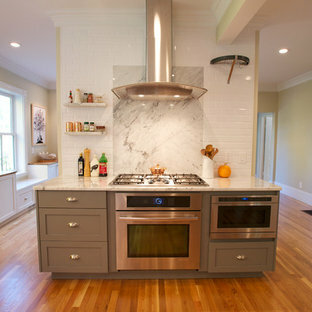 White Carrara Marble kitchen in Leonardtown, MD. 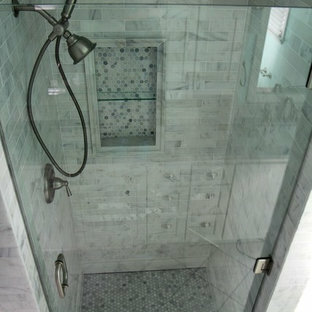 White Carrara marble tile and frameless glass door. The homeowner wanted to change the design a little and swap the dark countertops out for a gorgeous White Carrera Marble. 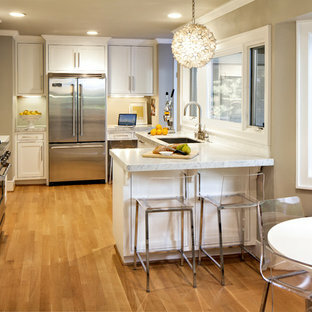 This home was built by Ezra Morgan Fine Homes. At Virtual Warehouse we wanted to give our customers plenty of choices, and make their buying experience as simple as possible.We hope you enjoy browsing our Online slabs selection.